Herald Square Dental & The Denture Center (New York) - Book Appointment Online! When it comes to your smile, experience counts; we have been creating comfortable confident smiles for more than 36 years. 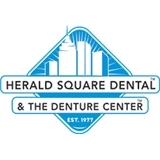 At Herald Square Dental,our team of dedicated professionals offer precision dental care in a wide range of restorative, cosmetic and implant dentistry options, as well as affordable denture choices. If you're missing one or more teeth, our mission is to restore your healthy smile. We enjoy a reputation for quality, state-of-the-art dentistry. Whether you are considering a maintanence exam, a power whitening, implants to permanently replace missing teeth, veneers, dentures, same day dentures, implant supported dentures or Invisalign, Herald Square Dental offers quality, convenience and affordability. If you would like more information,go to www.heraldsquaredental.com or,call our office and one of our patient care coordinators will be happy to help. I'll be going back. Dr. Yam was very considerate and kind, which is a nice change of scenery when you're dealing with other people in New York. I'm also one who's very apprehensive about going to the dentist because of dental anxiety, but everyone there did a great job even though I was quite nervous. Did not have Dr. Ian Pasch, but I did get a great dentist by the name of Alfred Shirzadnia. I highly recommend him! Also, the lady who did my cleaning, Elysia (something close to that), was extraordinarily kind and skilled. Doctor was very kind and patient. Very gentle. I felt very comfortable and will highly recommend him. She is sweet and explained things to me very well!